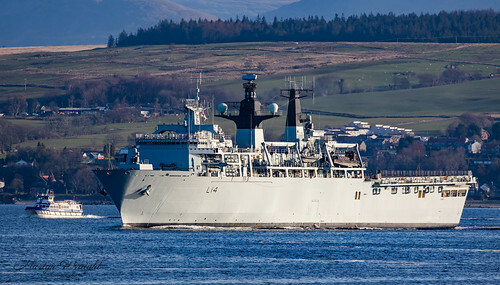 HMS Albion L14 Amphibious Transport Dock. HMS Albion is an amphibious transport dock of the Royal Navy, the first of the two-ship Albion class. Built by BAE Systems Marine in Barrow-in-Furness and launched in 2001. This Warship is generally used by the Royal Marines. She is sailing out of the Clyde in Scotland to join a NATO marine task force participating in Ex Joint Warrior April 2019.